"So what are you making for dinner? ": Hot Dogs on the Grill. When Chris called and asked what he was supposed to do for dinner, I asked him to put the hot dogs on the skewers and spiral cut them. That way the relish and other compliments get in the slices in the hot dog, covering up the taste! Sorry, but that is the way I feel. To me a hot dog is a small piece of meat (?) that holds all sorts of tasty condiments in a roll. Remember the roasted peppers from the other night. Well, they can make a hot dog taste quite good! Then we have the basic All American Dog. 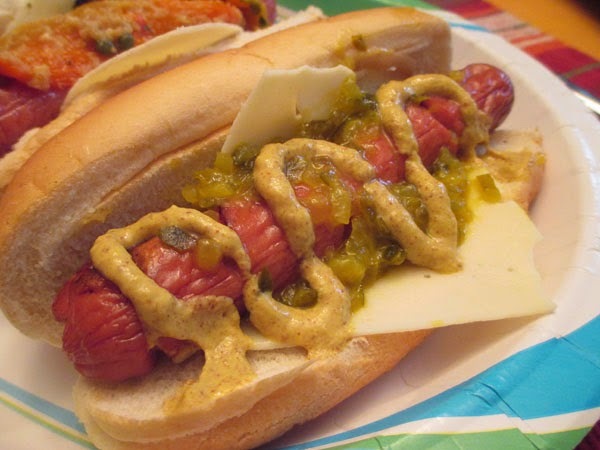 American Cheese, relish and mustard. cherry tomatoes and olives. Dressed with olive oil and lemon juice. I agree Lucia, a hot dog need some good dressings. I like to think up new ideas for them.